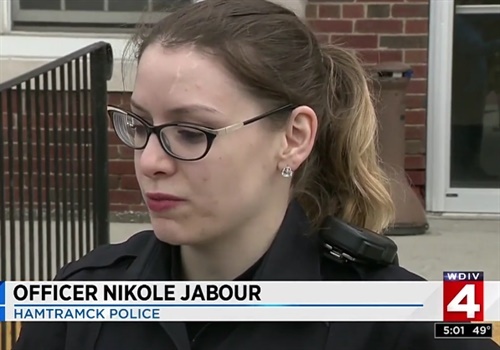 A lengthy police pursuit Tuesday through the streets of Detroit and Hamtramck, MI, ended in an impressive takedown when Officer Nikole Jabour tackled a driver who tried to make a run for it, reports WDIV. The 25-mile chase ended when the driver got out of the van she was driving, and she was tackled and taken into custody by Hamtramck officer Nikole Jabour. "Our dispatch called us to a chase in Detroit regarding a possible child abduction. So my partner and I started going towards the chase," said Jabour. Police said the chase started when they received a call and believed a child might have been in the van. The woman reached speeds of 80 mph on the freeway and led police through several neighborhoods, jumping curbs and front lawns. Jabour said she has been involved in chases before, but this is the first time she personally ended one with a takedown.